pVL-FH is a plasmid transfer vector which is recommended for expression of proteins "in fusion" with dual C-terminal FLAG-8xHis tag. Polyhistidine tag allows convenient purification of proteins using immobilized metal affinity chromatography (IMAC), whereas highly charged FLAG tag facilitates exposure of the polyhistidine tag on the surface of the proteins and allows their convenient immunodetection with anti-FLAG antibodies. 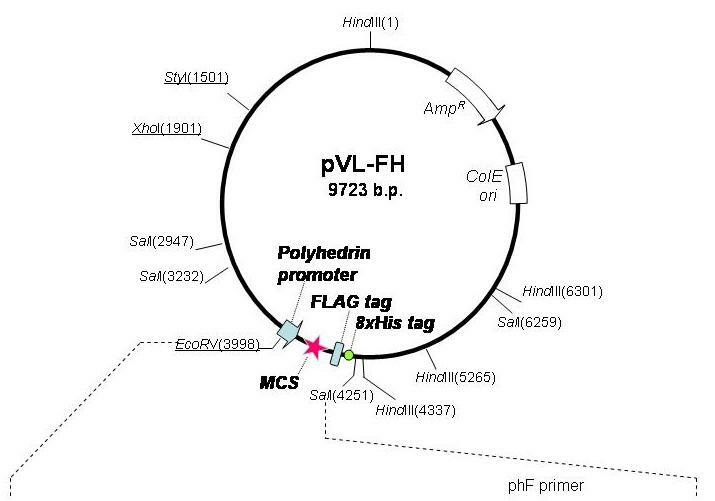 To this end, a PCR fragment encoding a foreign protein can be cloned "in-frame" with the FLAG-8xHis tag into pVL-FH vector which is digested at any of the restriction endonuclease sites located at multiple cloning sites (MCS) region.